In the spirit of giving and all things Christmas, it’s time for another recipe for you all. When I think of christmas food I think of aÂ lot ofÂ different flavours and foods. Maybe it’s becauseÂ Christmas always seems to be aÂ ridiculously huge feast! Some foodsÂ that come to mind (though of course not all in one meal or dish): seafood, fresh fruits (we’re in summer here now in Australia), gingerbread cookies, iced eggnog, and homemade ice cream, among other foods.Â Â I’ve already made some fresh berry frangipane tarts and pastured egg nog, now I’ve conjured upÂ a healthy almond and ginger cookie (sweetened with dates). I’ve been thinking of a few cookie recipes for a while now, but not until I made the frangipane tarts was I able to come up with the recipe. 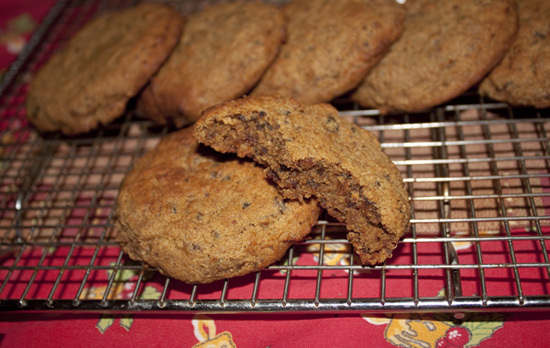 I have actually adapted the tarts baseÂ from this recipe to make these cookies. And if you’ve ever wanted to know the history of gingerbread have a look at this link. 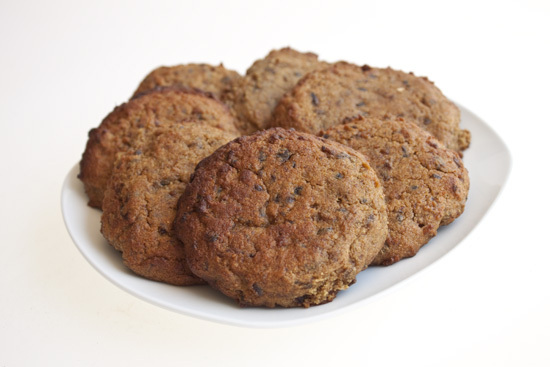 Allergen info/recipe info: These cookies are gluten-free and contain dairy-free options. First prepare the almond meal by pulsing it in a food processor or blender a few times to remove all the lumps. Add the bicarbonate of soda to the food processor/blender and pulse again (do not pulse too much otherwise you will get almond butter which you don’t want!!). Empty the almond meal-bicarbonate of soda mixture into a big bowl.Â Sift in the cinnamon powder, all-spice and ground ginger. Now roughly chop the dates. Add them to the food processor/blender and process until they have broken down into tiny pieces. Add them to the bowl and with your hands mix the dates into the almond meal. Go back to your blender and crack open the eggs and blend the eggs until they are thick and creamy. Add the ginger root and blend until it has broken down into the eggs and there are no lumps. Stir this into the almond mixture in your bowl. Melt the butter or coconut oil in a double boiler. While stirring briskly, slowly pour the melted butter/oil into the almond mixture until it is all mixed together. Prepare your baking tray: like the tray with a piece of greased parchement paper. Using an ice cream scoop, scoop some of the mixture and place it onto the parchement paper. Flatten out each cookie before you scoop more mixture onto the paper. Do this with all the cookie mixture (you may need two trays). Bake in the oven at 160 degrees C (fan-forced) in the middle rack in the ovenÂ for 6-10 minutes or until lightly browned. Don’t let them brown too much as the can burn quite easily. Enjoy with a glass of chilled pastured egg nog! For more dessert recipes have a look at theÂ recipe index. Â© Copyright: 2011 Michelle Robson-Garth. Please ask permission firstÂ when using any text or images on healthfoodlover.com . See theÂ disclaimer here. Have a look at theÂ recipe index for moreÂ health food lovinâ€™ recipes. Join theÂ Facebook page & followÂ Health Food Lover on twitter. Health Food Lover is Michelle Robson-Garth. 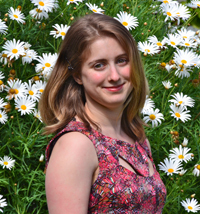 Michelle is a degree-qualified Naturopath (BHSc) and Massage Therapist. She is also a passionate writer, recipe-creator and all-round foodie from Melbourne, Australia. © Copyright: 2009-2012 Michelle Robson-Garth. Please ask permission first when using any text or images on healthfoodlover.com. Read the disclaimer here. Have a look at the recipe index for more health food lovin’ recipes. Join the Facebook page & follow Health Food Lover on twitter. Thanks for sharing this recipe! Am going to add it to my list of recipes to bake with Mr3! Happy Holidays! Hi Jolene. I hope you enjoy the cookies, please let me know how it goes! Happy Holidays to you as well! MMMMM,..;What lovely & tasty cookies these were! My friends & I loved them so much! Sure ;). Haha I get what you mean! With Christmas around the corner. These are a must have for my own indulgence! Awesome, I’m so glad you like them Vanessa! Thanks for stopping by!